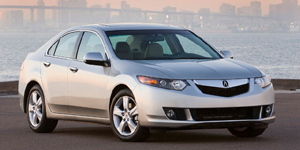 All-new for 2009, the front-wheel-drive Acura TSX receives a revised, more aggressively styled exterior and a higher quality interior with almost anything, including navigation, sunroof, and power seats, as standard. The only engine remains the 2.4l 4-cyl. known from previous model years.